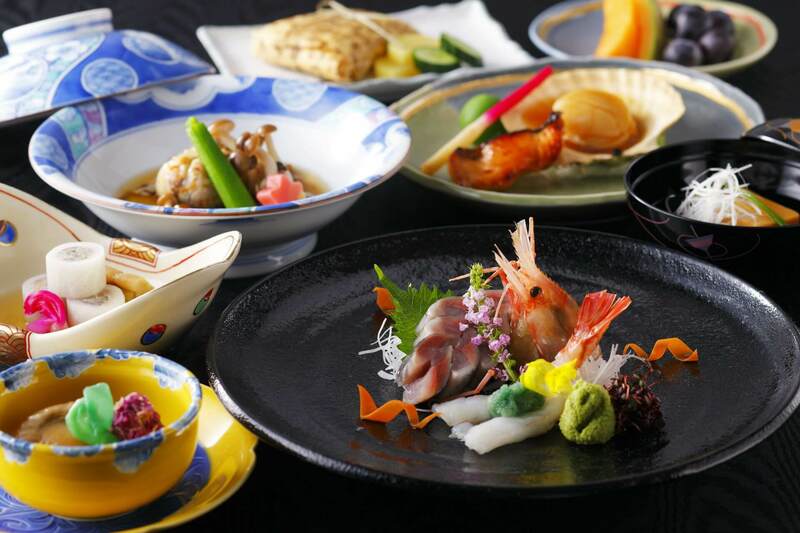 A Japanese-style restaurant where you can enjoy the fresh seafood from Hokkaido, in a delicious Kaiseki style, traditional Sushi and a splendid Teppanyaki arrangement. We prepare a variety of Hokkaido Food Specialties dishes with specially selected ingredients and cooking methods, together with premium service in a quiet space where you can enjoy fine dining. Please also enjoy sake and shochu from all over Hokkaido. We prepare a delicate Japanese cuisine with ingredients from Otaru's mountain and sea fused with innovative ideas. Please pay attention to the technique utilised by the Teppanyaki chefs that make the best use of the food material and cooking fresh seafood, vegetables, beef etc. on the iron plate in front of you. The semi-circular Teppanyaki counter, where you can enjoy your meal while watching the outstanding performance by the Teppanyaki chef, is the perfect space to entertain your valuable guests. In addition, there are 2 private dining spaces which can be used for formal dining. Whether it be Tenppanyaki or private dining, we will welcome you with the highest standard of professional service and hospitality. Set menus featuring Hokkaido Wagyu beef are available. Enjoy the experience of traditional Japanese cuisine. Location: Level 2, CocoroTiming: 5:30pm to 8:30pm (last order) Hokkaido Wagyu Sukiyaki Dinner SetPrice: JPY5,940 Onion savory egg custard topped with salmon roe Sashimi Scallops grilled with potato cheese Sukiyaki set (vegetables, Hokkaido Wagyu beef, raw egg, udon noodles or rice) Dessert Hokkaido Wagyu Shabu-Shabu Dinner SetPrice: JPY5,940 Onion savory egg custard topped with salmon roe Sashimi Scallops grilled with potato cheese Shabu-Shabu set (vegetables, Hokkaido Wagyu beef, sesame sauce, ponzu sauce, various condiments, udon noodles or rice) Dessert Extra helpings of meat and vegetables available (separate fee) Operation days and hours, prices are subject to change during holiday seasons such as Christmas, Year-end, New Year, and Golden Week.